Beech Hill School has been rated as OUTSTANDING in all areas during the latest OFSTED inspection carried out in January 2016. It is an exciting and inspiration place. Our success stems from a relentless drive to put memorable learning experiences at the heart of all we do. The Arts play a key role in giving every child at our school a vital channel for self expression, and we provide a wealth of opportunities for children to discover, explore and extend their natural talents within our extensive grounds, our forest school offers a magical world of discovery. Here children learn first-hand about the riches of the natural environment whilst developing important life skills such as team work, problem solving and resilience. Children have just one childhood; our intention is to provide them with inspirational and unforgettable learning experiences. We place a high value on establishing close links between home and school so that we can work effectively together enabling each child to achieve their full potential. 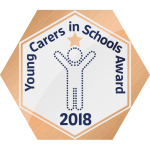 Beech Hill is committed to identifying and supporting Young Carers. Changing personal details: If you have changed any personal details such as address and telephone number, please print the form below and bring it to the school office. A copy is also available on request.